As the final section of Part 2 we are asked to develop three stitched textile works building on from the paper explorations. I wanted to further experiment with the bark I had stitched into before, but I wanted to explore different ways of merging it with my stitched work. Upon considering the stitches I used to embellish the origami crumpling flower I wondered if I could work this type of stitching to create a work with the bark. 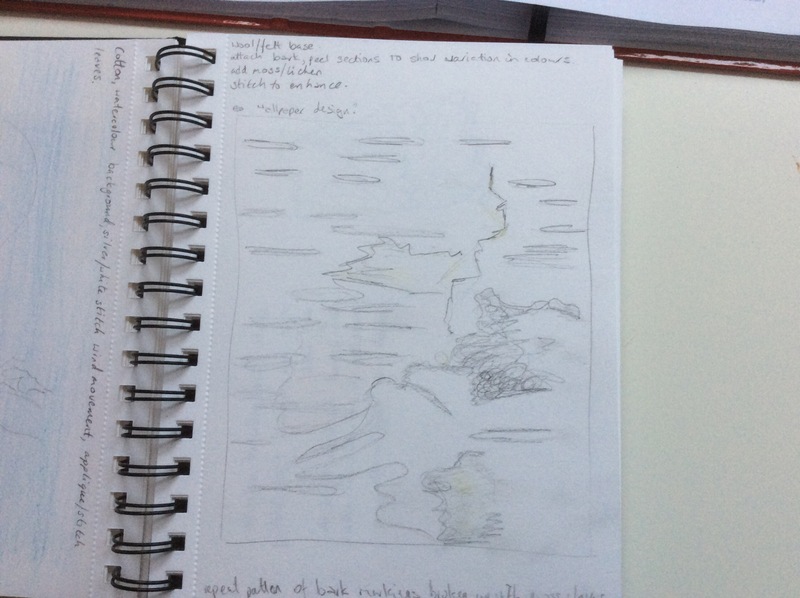 My initial thoughts in my sketchbook. I used a piece of heavy upholstery felt that I had held onto after a bed delivery. I then glued the bark in layers leaving a section empty where I would stitch into. My idea was to build up a moss and lichen surface as you would find growing on the tree. I actually purchased a little florist moss which I was going to use to build it up but in the end I preferred using my stitches to build up texture. I used a mixture of french knots of varying number of loops, I cut through stitches to create fluffy, hairier types of moss and I used a mixture of greens and greys to build it up. Where there were some splits in the bark I added a few sections of brown cut stitches. It was fairly labour intensive and took longer than I had expected but I haven’t really done embroidery before only cross stitch. When I was younger the embroidery kits bored me as they didn’t give much space for doing your own thing! However I really enjoyed doing this piece and I was quite pleased with the work. I’m afraid I didn’t stick to the suggestion to stick with material that possess relatively traditional qualities for this piece but I do think this piece could be used as a basis for a wall covering if it was manipulated using digital means it could be repeated and stretched. Moving on with the natural theme when I had originally taken leaves in the Autumn from the Japanese maple I had decided to try and preserve some with the possibility of using them in my work at some point. I preserved them in a mixture of glycerine and water which meant they held a slight flexibility to them and didn’t dry out to much. They didn’t quite retain the bright red colour but had dulled down to a purply brown colour. My composed paper sample of the leaves blowing from the tree worked quite well and I wondered how I could transfer this to material. I took white cotton and tried to watercolour it with my Caran d’ache neocolour II pastels. I wanted the sky to have a muted colour scheme. I was trying to replicate the colours you get in a wintery skyline when there is a break of sunlight through the grey clouds and a glimpse of the blue sky. 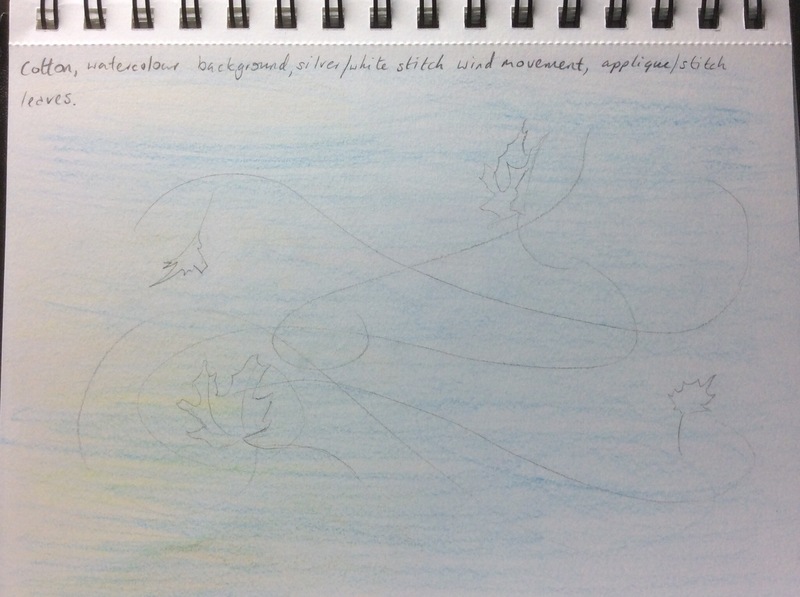 I wanted to use stitch to create the wind trails and applique my leaves into the picture. I initially thought I would use a sewing machine to accomplish this but after a bit of experimentation I realised I would need to learn more about machine embroidery techniques. I was actually glad this happened as hand stitching it meant I had more control and could play with the length and density of the stitch, giving the desired effect of the wind blowing and changing strength. I used white and grey threads to give the impression of cold. I stitched the leaves onto the piece after considering placement using a stitch that followed some of the veins much like I had in one of my paper samples. I used a similar shade so the stitching blended in. My third piece was inspired by the paper tesselation and the geometric patterns within the dress drawing and my subsequent paper pieces.I was quite interested in this and the shapes that could be produced. I had continued some research into this and wondered about the possibility of fabric being manipulated in this way. I was interested to find the fashion designer Issey Myake had produced collections using this style, (Issey Miyake Origami Fold 132 5 Eco-fashion line Reality Lab, 2011). This inspired me to find out how I could try this in some small way. I discovered a piece of footage (Get Fabric Pleated, 2015) where a company called Ciment Pleating explained the process in how they pleat fabrics by using a steamer. 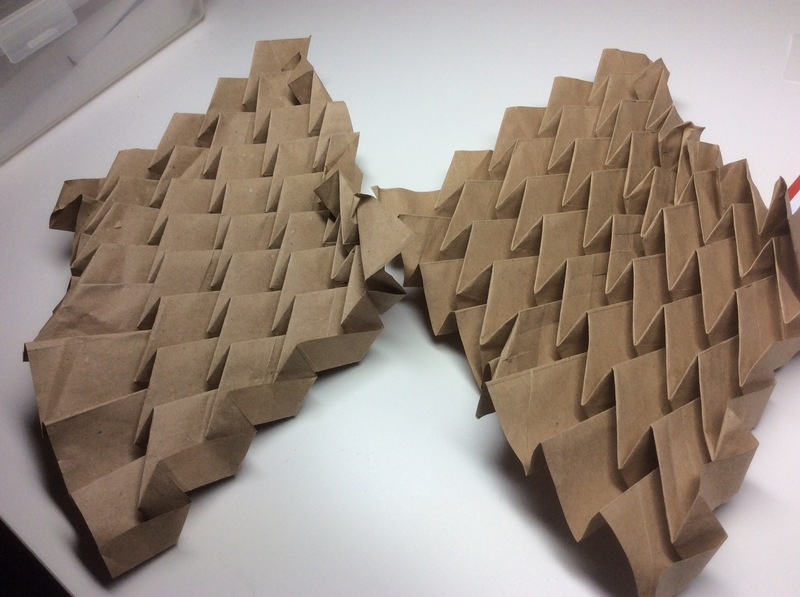 I first had to make two molds from Kraft paper which I had several mistakes but eventually produced two pieces. I then sandwiched a piece of white polyester between the two pieces, refolded and clamped the three layers together. I put it in my oven at 160 C and put a dish of water in the base of the oven and left it in for 15mins. After removing it I waited till it had cooled totally before holding my breath and unfolding it. I was delighted with the result. My stitching on this piece was very simple. I tried a couple of different ideas firstly stitching floral patterns and also using shiny embroidery thread which didn’t work well with the fabric or the drape. I settled on a basic line of stitching to highlight the zigzagging lines. I then stitched it into a tube, I liked the way the fabric draped. I think this could be developed it would make an interesting cuff on a blouse or similar. I like how it distorts the traditional floral pattern on the original fabric it gives a very different appearance to the fabric.